I caught up with a good friend of mine recently over coffee. We had a wonderful time talking about the things we have been doing with the things we love doing; he and his photography, me and my writing. As we enjoyed a delicious array of cold cut mini sandwiches, scones and cakes in the very English setting cafe with its lace table cloth adorning the tables, fine china and silver utensils, he showed me some of the photographs he had taken with his phone's camera. Barry had always had a good eye for details and the pictures he took were beautiful. It had always been his dream to be a photographer and though he did it as a hobby for most of the time, he did find a job that required him to use his skills with the camera. He said, "Once you have dreamt, it's not really your dream anymore. It belongs to the world. You caught it from the sky." I smiled at his words as I loved the idea. A sky lit up with dreams instead of stars. A world where everybody's dreams float in the air, invisible, but up for grabs. The one who catches and acts on it first leaves the footprints of the dream on the world. Sounded nothing less than a magical realism piece plot. Being a freelance Film Producer, photography and visuals are a big part of my life. There is something magical in seeing a storyboard come to life through camera works. But as much as I enjoy producing 'moving pictures', I still feel like there is something missing. Writing provides me a way to connect with the inner world while photography with the outer one. To be honest, I enjoy this travel to the inner world much better than the outer one. As a writer and a visualizer, I feel photography doesn't do much justice to what I observe outside. Writing needs a thorough sensory experience whereas photography brings all the attention to sight, stealing attention from all the other senses. As a writer, our job is not just to express what we see, but also to capture what we hear, how it sounds, the smell, the taste and the feel of a place, which no photograph can capture as beautifully as our memory while experiencing it, and our words when remembering it. Writing allows us to be fully present in the moment with all our senses, not just once but twice; once while living it and then reliving it while writing. Our words have the power to evoke the very same sight, sound, feeling, smell and taste as clearly as we saw them and also, reinterpret and reimagine them. Photography lets you edit and do the same, make magic with the art form, but very rarely all the senses are evoked with a photograph. For example, when I read the word 'petrol', I smell it, see it, hear it being poured into the car tank, I don't taste it because it's toxic; you get my drift. However, when I look at a photograph of petrol, I just see the sight. And if I happen to be the one who took a photo of a petrol tank, all it will do is it drifts me into that moment and the memory that I see of me taking that picture, which frankly, is quite insipid and uninspiring and not at all visually stimulating. Writing offers something else that's fundamental for expression. Retrospect. 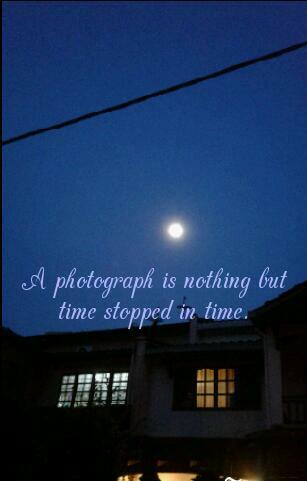 Pictures can't be clicked in retrospect but words can be written. Retrospect frees the writer to live in the moment without having to worry about their art, which is only to be done later, at peace. It gives the license to fully live the life as it comes and separates living with writing. You don't have to compromise one with the other. And contextually, it lets an idea reach its complete ramification. Photographers might take offense and say, 'A picture speaks a thousand words', and that is truly so, however, my concern is not for the picture that's taken but the person taking it. Do they miss the bigger picture in the pursuit of perfecting the smaller one? Think about it.